One of my favorite holidays to celebrate with the kids is Easter. 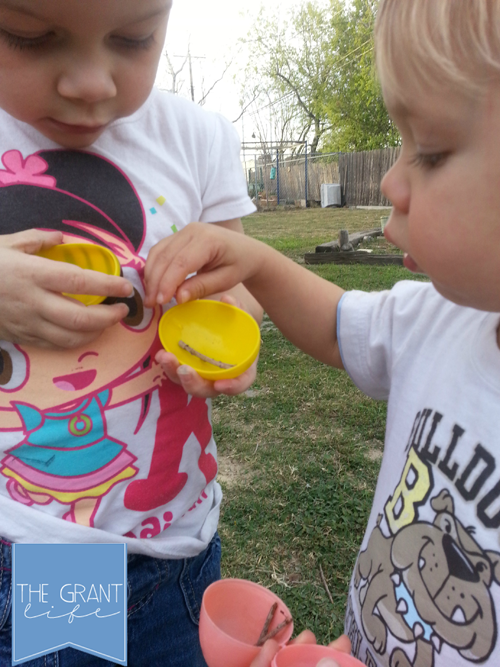 There are just so many fun Easter activities for kids that I thought I should start early. 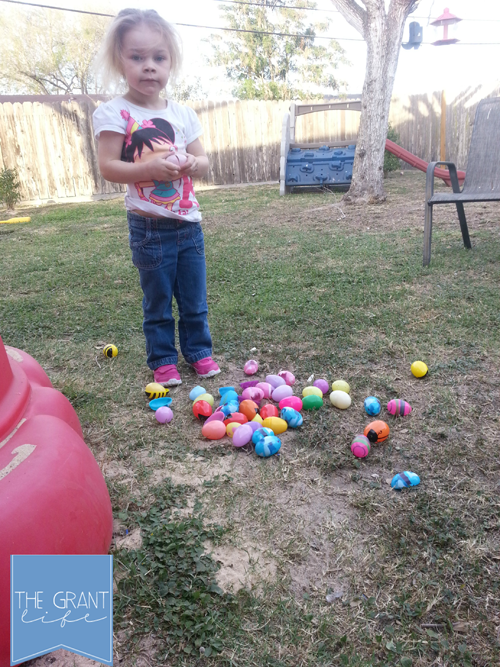 This past week my kids and I had some Easter fun, we did a little activity I like to call reverse Easter egg hunting. 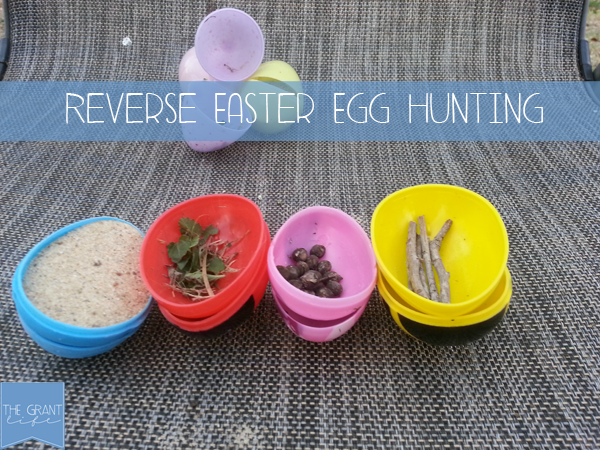 I’m sure you’re thinking – What is reverse Easter egg hunting? Well, in regular Easter egg hunts you search for the eggs that are already filled with goodies. In reverse Easter egg hunt you find things to fill your eggs! 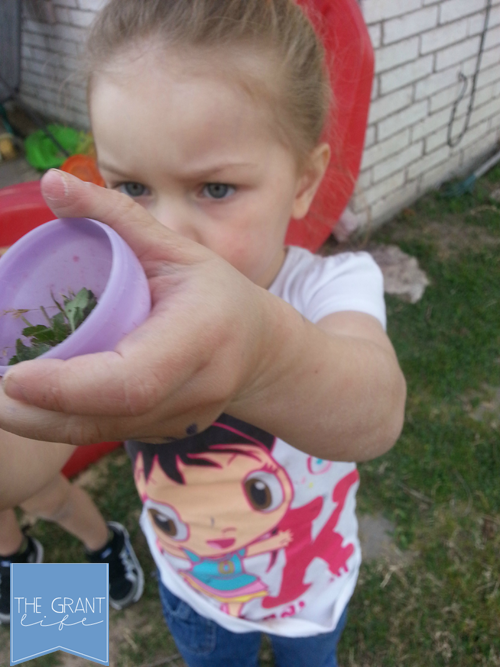 This is a real simple activity that my kids just loved! All you need to have your own reverse Easter egg hunt is a nice day and a dozen or so empty Easter eggs. I gave the kids a few directions on what to fill their eggs with and set them free. 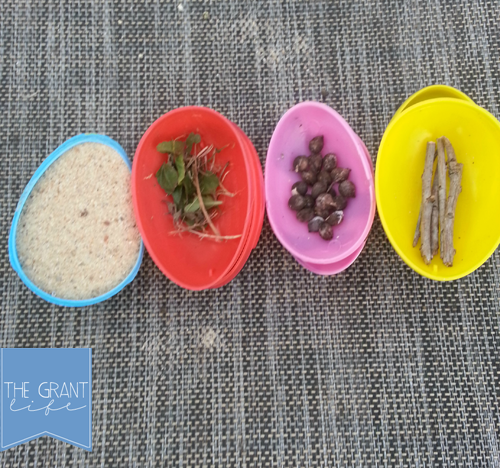 We gathered leaves, sticks, sand and seeds. This activity can be fun for older kids too! One way is to have them find colorfully things that match their eggs. My kids were pretty proud of their findings and loved showing them off. Once they filled one egg they would grab another and start the hunt all over again. We had a blast with our reverse Easter egg hunt! I’m sure we will have many more ‘hunts’ before the big one at the end of the month! How clever…my kids would love this activity!! Definitely going to do this over the Easter weekend. Thanks for sharing at the After School Link up. How fun for the kids! Thank you for sharing this in our Crafty Showcase! We love that you share with us. Your projects are inspiring! We love this and you are being featured today!!! what a cute idea. Thanks for linking up at Tell Me About It Tuesday. We hope you hop over and share with us again next week. Can I have your permission to use this post in a round-up of posts on my website related to Easter? This is a really terrific idea. I am pinning it! I had to read just from the title – and I totally love this idea! I am going to play this with the grandbabies and I bet they will have a blast!! We would love if you linked up to our Snickerdoodle Sunday sometime! What a simple, open ended activity! I am sure I would end up with eggs filled with acorns! Awesome idea, full of sunshine, fun, and very little cost. Love the idea you get the exercise for the little ones without all the sugary tooth candy too! Also, I am crazy about the idea as it works awesome for two special needs kids of ours! Novel idea, and perfect for ALL KIDS AND AGES and even Grandparents! We are going to leave 5 eggs in our trunk basket for our spring/summer outings. We can do this on any trip, to give a car break or when you have to wait somewhere with kids! Moms ROCK ! Thanks for letting us in on your secret, your share is just plain brilliant! Happy EASTER and family fun! We are headed out for the sunshine today! Such a great twist on this game. I’ll definitely use it this year at Easter. What a cute idea! Thanks for sharing your tips and the lovely photos of your kids.